This recipe comes from my girlfriend Annette. Mix all ingredients except pie filling. Spread in greased jelly roll pan. Place 2-3 cherries (5 squares across short side of pan). 1 to 2 inches apart. Bake 35 minutes at 350 degrees. Cool completely. 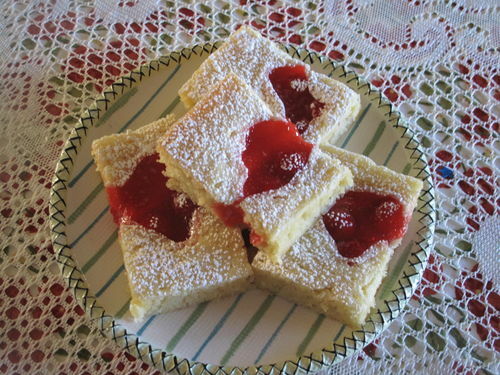 Sprinkle with powdered sugar and cut in cute little cherry squares!